Author Jessica Linhart’s newly released “Depressed: Super Heroes of the Bible” is a look into depression and anxiety as displayed through characters in the bible. “Depressed: Super Heroes of the Bible” from Christian Faith Publishing author Jessica Linhart is a look into depression and anxiety as shown through biblical characters. 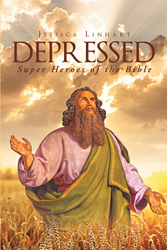 “Depressed: Super Heroes of the Bible”: a gripping and potent text that uses the bible to encourage readers to reflect upon the stories and the relevance these tales may have on the reader’s life. “Depressed: Super Heroes of the Bible” is the creation of published author, Jessica Linhart, a former special education teacher, Jessica spends much of her time enjoying nature and her family in West Virginia. Published by Christian Faith Publishing, Jessica Linhart’s new book depicts the struggles of depression and anxiety in the light of biblical stories and characters. Through the text and bible readers are encouraged to reflect upon these stories and the relevance these tales may have on the reader’s life. Through classic tales such as that of Adam and Eve, Abraham, and David Linhart shows the various means by which depression and anxiety can start and how it can affect people of all walks of life. Additionally, this reading allows readers to further explore depression and anxiety through the bible by giving readers space to reflect and delve deeper. View a synopsis of “Depressed: Super Heroes of the Bible” on YouTube. Consumers can purchase“Depressed: Super Heroes of the Bible” at traditional brick & mortar bookstores, or online at Amazon.com, Apple iTunes store, Kobo or Barnes and Noble. For additional information or inquiries about “Depressed: Super Heroes of the Bible”, contact the Christian Faith Publishing media department at 866-554-0919.